Just walking in the rain with the one you love. Completed 2016, this large (3ft² ) oil on canvas painting by artist David Patersons is set in the centre of Elgin, Moray with St Giles Church on the right. It invokes the artists memory of visits to the "Tower", a local nightspot till the 90's, seen left centre. 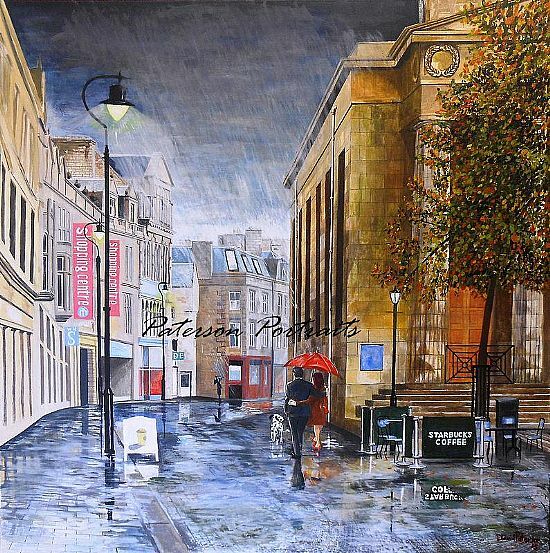 This painting is a large statement piece portraying an atmosphere of romance. With it's fine detail it would create a prominant feature on any large wall.